The Yazoo River Basin, Mississippi’s largest basin, drains an area of about 13,355 square miles. The basin covers all or parts of 30 counties and is about 200 miles in length and up to 100 miles in width in its northern half. Major streams include the Yazoo, Tallahatchie, Yalobusha, Coldwater, Bogue Phalia, Yocona, and Sunflower Rivers. Four major flood control reservoirs are also located in the basin – Arkabutla, Enid, Sardis, and Grenada. The outlet for the basin is the Mississippi River at the confluence of the Yazoo River north of Vicksburg. Surface waters (e.g., streams, rivers, lakes, estuaries, etc) are assigned intended uses. These designations allow regulatory agencies to establish water quality goals, which protect aquatic life and allow safe use by the public. These goals are referred to as Water Quality Standards. The designations that exist in Mississippi are Public Water Supply, Shellfish Harvesting, Recreation, and Fish and Wildlife (i.e., Aquatic Life Use Support). 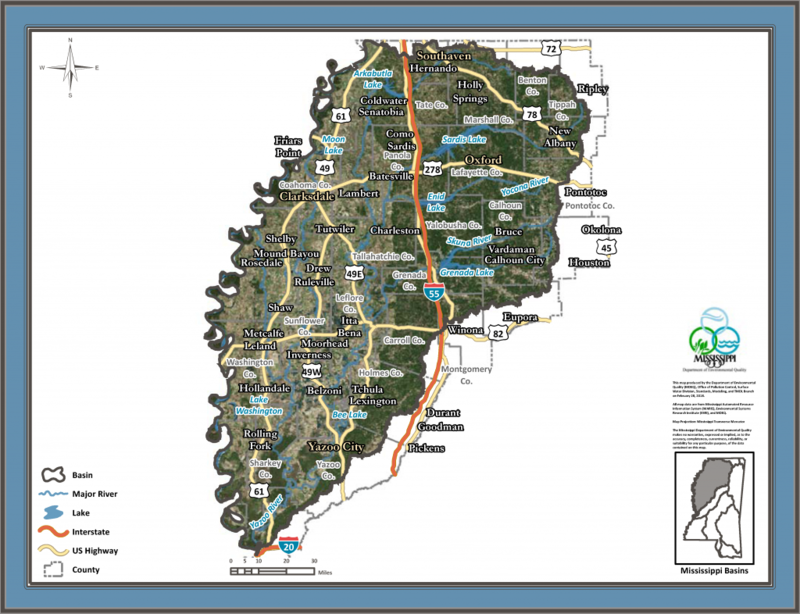 Click the link below for a map or a list of the designated waters of the Yazoo River Basin.